Your first impression...a very important reality! Who can forget...that first glance, the fleeting look, the promise of more. No we’re not talking about your first love, we’re talking about your powerful first impression. 1)	You want to sell your house... Curb appeal is critical to a quick sale at a premium price. 2)	Your home is a romantic creation…you pour your heart and soul into its decoration and maintenance. 3)	You are naturally fastidious and like to keep the nicest house on the block. 4)	It is easier to maintain a well-kept house than one which is neglected. This house pictured below is in need of life support for its lack of curb appeal or any other kind of appeal. Lest you think this home is abandoned, look carefully at the porch roof...there's a satellite dish installed, someone lives here or if unoccupied, it wasn't too long ago that they left. 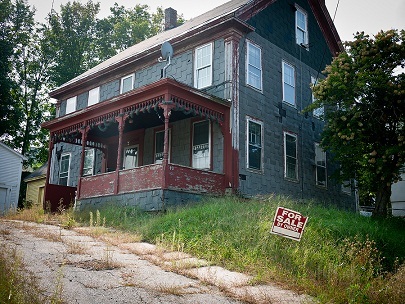 Clearly the home had been neglected for quite some time and it will take a monumental effort to bring it back. Can you say "bulldozer"? A smart homeowner knows that visuals are powerful. Especially a visual as big as a house, now THAT’S bigger than a billboard and we all know how persuasive a billboard can be! A home’s front exterior has the potential to deliver a big punch in the visuals department…why leave that to chance when a few simple fixes can raise your home’s curb appeal rating? What does your home say about you? Is the paint and siding in good repair? Is it neither the best nor the poorest house in the neighborhood? Does it look like happy people live there?...flower pots, welcome mats, thoughtful decorations. If you’re selling, make it pleasant but not so personal. You want everyone to believe that they could be happy in your house too! Keep the kids toys and your toys out of sight. Rusty car parts and old tires are a big no-no. If there’s a lawn, mow it regularly and keep it looking nice. You get the point...don’t go over the top with accessories but rather keep what you have looking cared for. I mention this last but it should be first, create a tasteful and appropriate color scheme for the exterior including a welcoming color for the front door that fits in with the standards for the neighborhood. 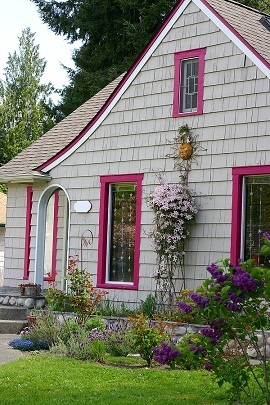 This sweet little cottage is a wonderful example of "what-to-do". It might not be in everyone's taste, but it certainly has charm and interest. We want to go inside...the trim color is over the top but in reality, that's why it works. The home owner had the guts to take an idea and run with it...it's just this side of outrageous but the style of the house can carry it. While all the decorations are what you see when you begin to look around, the big face of the house and its color is the very first thing you see. If your house is some garish color or worse yet is boring, all the decorations and polished door knockers in the world aren't going to make up for it. Start with good color, you’ll get the most mileage out of it!